Big Thunder from Ainsworth takes you right into the jungle where you can try your luck to find some treasure. The game also features the mighty gorilla who can help you find even more treasure in the game. The sounds of the game are pretty basic and there is no background music, just sounds when you spin the reels and trigger features. These effects are mostly standard slot sounds and not very creative. The symbols however, are nicely drawn. The special features are wild substitutions with the gorilla, free spins and the King Strike Feature. The game has a high volatility, which means that you will need a higher budget to play the game, as you will probably have many rounds without wins, but instead get the chance to win a larger amount in a single spin. The King Strike feature can yield good prizes, but it's hard to trigger it. The theoretical return to player is 94.38%, which is similar to other slots from Ainsworth, but lower than many other online slots. You can also play Big Thunder mobile, the game has been developed to be compatible with many Android or iOS devices. You can visit the jungle and play Big Thunder for free on this page. 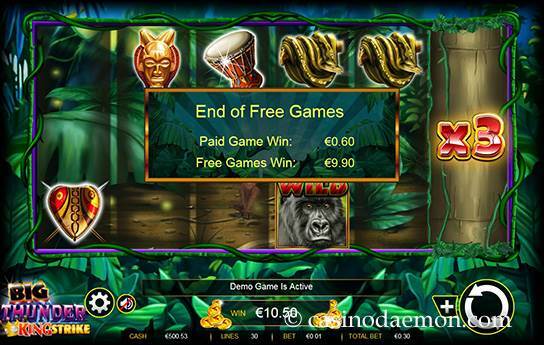 If you like the slot and want to explore the jungle you can find it at one of the online casinos mentioned on this page. 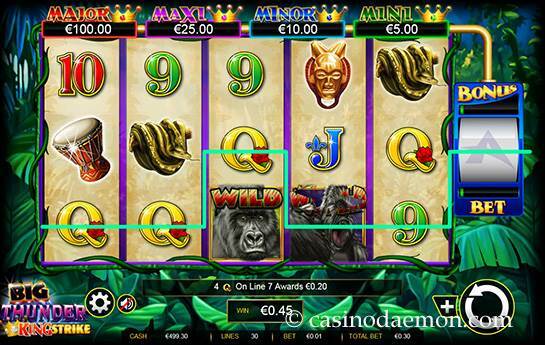 The special symbols of the slot include the gorilla who can stand in for other symbols, except the scatter, and he can appear only on the last three reels. The scatter symbol with the game logo that can award a payout regardless of its position, as well as trigger the free spins. The Bonus Reel free spins start with three scatters. 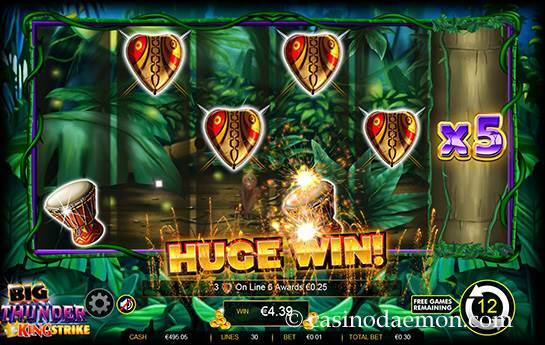 During the free spins two additional symbols x3 and x5 are added to the reels, and they multiply the wins for that game round with the respective value. The free spins can also be re-triggered, and the general payouts of the free spins are higher than in the base game. The King Strike Bonus is a special prize that you can win. The four different types are shown above the reels, Major being the highest, then Maxi, Minor and Mini. You can win the bonus when you get 5 of a kind pay-line combinations in together with the crown on the 6th special reel. The Big Thunder slot has 5 reels with up to 30 variable pay-lines. You can select coin values between 0.01 and 100 £/$/€, which means the minimum in on spin is 0.01 £/$/€ for one activated line, 0.30 £/$/€ for all lines, and the maximum bet is 3,000 £/$/€. Although we do recommend playing with all lines, we don't recommend playing with the highest stake. 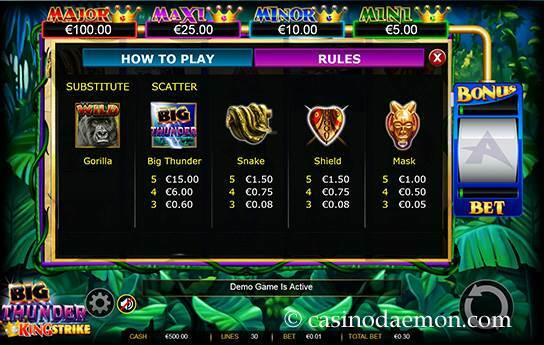 You can find many bet sizes in between and also select automatic play of 25 spins at a time.